S E Plastering & Property Maintenance has been established since 2004 and thrive on providing a professional and reliable service to the domestic and commercial market in the yorkshire area. We are a castleford based company but are willing to work further afield. We pride ourselves on a clean and tidy service. We provide free estimates so call us today to arrange a viewing all contact details can be found on our contact page. S E Plastering has worked for most large home builders including David Wilson Homes, Barrat Homes, Chris Noble Homes, Interserve and currently is a certified contractor to B&Q & the estate of Nostel Priory, Ledstone Estate, Ledsham estate and is now a registered installer of DryZone products for rising damp and timber treatments offering a 30 year warranty. NVQ levels 1, 2 & 3 - cscs card registered. 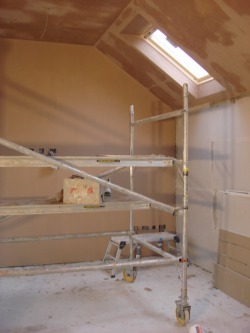 Plastering and rendering - internal and external, commercial & domestic. damp proof course (DryZone) & timber treatments with 30 year warranty. General building work also undertaken e.g garden walls, drainage, guttering, facias & soffits, pointing etc. joinery, laminate floors, skirting, arcitrives, stud walls etc. full kitchen and bathroom design & install service. roof repairs & epdm flat roof systems. Any size of job undertaken.